intro: When a location on Earth is compared to heaven, it must be worth taking a second look. 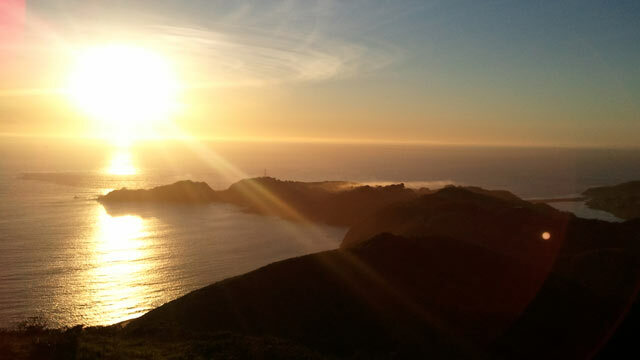 That is how Point Reyes, Calif., landed on Good Morning America's list of the "Most Beautiful Places in America." "My most beautiful place in America is Point Reyes, Calif., "GMA" viewer Kathleen Rockwell of Oviedo, Fla., wrote when submitting her photo of a dramatic Point Reyes' sunset to the "GMA" search. "I visited there in January this year with my husband ... We drove over there to the top of the mountain and got out and walked around." "The view looking at the Pacific Ocean from there was breathtaking -- you felt like you were in heaven," Rockwell continued. "I've seen some beautiful country sides in different states, but when I was standing there looking out, it looked like heaven...it made me cry." Located just outside San Francisco, and right along the San Andreas fault line, the natural beauty you see at Point Reyes is all the product of earthquakes. The 1906 earthquake that decimated San Francisco also moved the peninsula of Point Reyes 18 feet to the north in less than one minute. Positioned on the Pacific Plate, the peninsula is part of the Sierra Nevada mountains that were moved north from Southern California by the San Andreas fault. Point Reyes' beauty today lies in the sensory overload you experience as soon as you step outdoors. The panoramic views of the Pacific Ocean fill your eyes; the smell of sea air mixed with the area's fir, pine and eucalyptus trees consumes your nose; the sand of the sea touches your feet; and, for your ears, there's a virtual cacophony considering half of all North American birdlife can be found at Point Reyes. The best part about Point Reyes is there is only destination you need to hit to take it all in, the Point Reyes National Seashore, a definite, don't-miss destination. Millions of visitors have come to explore this spectacular park in the years since President John F. Kennedy signed legislation to create it in 1962. You can spot gray whales migrating past the Point Reyes Lighthouse, meet Tule Elk at Tomales Point, kayak in quiet lagoons, and explore secret tidepools and hidden sea caves. Here are five ways to enjoy the Point Reyes National Seashore, your one-stop destination in one of America's Most Beautiful Places. quicklist: 1 title: Take To The Trails text: The Seashore features more than 150 miles of hiking, bicycling, and horseback riding trails winding through 71,000 acres of land and 81 miles of protected coastline. quicklist: 2 title: Look Above text: Over 450 species of birds have been sighted throughout Point Reyes, giving it a feather in its cap for having, by far, "the greatest avian diversity in any U.S. national park." The nearby Audubon Canyon Ranch is an egret and heron sanctuary, while the Point Reyes Bird Observatory in Bolinas, Calif., is the only full time ornithological research station in the U.S.
quicklist: 3 title: Look Beyond text: From December through April over 30,000 gray whales pass by the Point Reyes Lighthouse on their southern then northern migrations while approximately 1,000 elephant seals take up residence and give birth to their pups at Chimney Rock. In the spring, wildflowers bloom profusely throughout the park. quicklist: 4 title: Look Through a Lighthouse text: Point Reyes is the windiest place on the Pacific Coast and the second foggiest place on the North American continent, posing a threat to the many ships entering and leaving San Francisco Bay. The historic Point Reyes Lighthouse warned mariners of danger for more than a hundred years before it was retired from service in 1975 and replaced by an automated light. Today, the lighthouse is a museum for visitors to enjoy year-round through daily tours, exhibits, whale-watching excursions and even special, evening lighting tours. quicklist: 4 title: Jump In the Water text: A visit to this most beautiful place would not be complete without a dip into that sparkling waters that surround it, but you don't even have to dip your toes fully in to enjoy the beauty. If you make it to the Seashore between the months of July and February, kayaking should be your preferred method of travel. Tomales Bay, a 15-mile long, 6,780-acre tidal water body, is the largest unspoiled coastal embayment on the coast of California, and the most popular spot for kayaking in Point Reyes.